It's almost a pipe dream, getting that absolute perfect piano sound out of a digital or an analog source; replicating the natural sound of wood and hammers; and even more importantly, creating a sound that is vibrant and room filling (basically, one that doesn't come from two 3" tweeters stuck under the keys). And on that never ending quest for the perfect digital piano sound, Roland U.S. has recently released the newest edition of the V-Piano Grand. This instrument combines a further-updated version of Roland's V-Piano sound technology along with individualized samples of all the working parts of a piano. The polished ebony body and the half-size soundboard don't hurt it's sound, either. At the heart of the V-Piano Grand is component-based modeling technology which attempts to recreate the complex interactions of all the parts of a piano, resulting in a more organic sound from the key to the speaker. The idea, Roland stated, was to create a "living" piano engine that could replicate every detail of the process of generating sound in an acoustic piano, starting from the simple act of the hammer hitting the strings. The new speaker system is also a major factor, with the on-board sound engine placing the various samples of the piano action, keystroke, and strings to the appropriate locations in real time. Sound placement changes fluidly and naturally based on the performance to a point where the player and the audience may not be aware of the existence of speakers without some conscious thought. Hammer-clicks sound closer, for example, and ringing strings are at a distance. It's a feature that's completely unique to the V-Piano Grand, largely because it's the only model with space in the cabinet to make this work. The piano library has been greatly updated as well with a full collection of vintage pianos as well as modern sounds, each one as meticulously modeled as the last. Pianists can choose from beautifully-crafted authentic Vintage to never-heard-before futuristic Vanguard piano model presets, or can create their own custom dream collection. 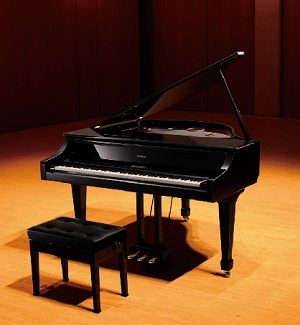 The V-Piano Grand also features the newest progressive damper action pedal and PHA III Ivory Feel Keyboard with Escapement, Roland’s finest piano action that drastically improves key repetition, provides the authentic “click feel” of a grand-piano keyboard, and includes moisture-absorbent material that prevents slipping during performance. Speaking as a man whose hands have been known to sweat during a performance, it makes a huge difference. For more information on the V-Piano Grand, check out Roland's website.